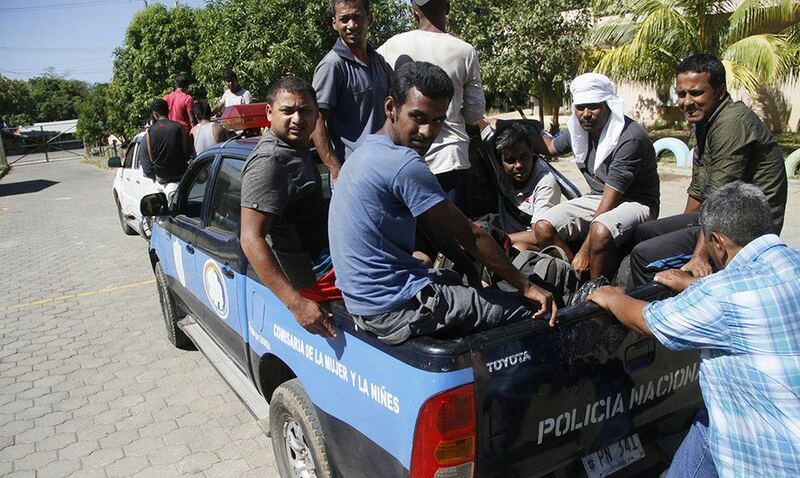 TODAY NICARAGUA (MANAGUA) Police in Nicaragua say they found, on Thursday, 15 Bangladeshi migrants wandering lost on a highway after their smugglers abandoned them. The men, aged between 18 and 33, were located at kilometre 43 of the carretera El Crucero-San Rafael del Sur, about 20 kilometres south of Managua.according to Leónidas Roque, deputy chief of the la Policía en San Rafael del Sur. The police chief said the migrants had made their into the country by way of Costa Rica and were headed to Honduras, on their way to the United States, but they were robbed by the coyotes (smugglers). Alí Morobel, one the migrants, told El Nuevo Diario that he and his compatriots had been walking for three days since entering Nicaragua through one of the “blind spots at the Costa Rica border”, before being rescued by the police. Ali added that the paid between US$100 and US$500 each to cross Nicaragua. The migrant said their left their home country for political problems. Authorities say the group of foreigners were taken to the San Rafael del Sur health centre where they will undergo a medical exam and treated for dehydration and other health problems due to walking long distances. By late afternoon the foreigners were taken to the immigration shelter, located in Managua. Next articleTen Films Based On Scientific Discoveries. Costa Rica Is #4.